“Small artifacts tell big stories. Were prehistoric Native Americans hunting on the rocky Isles of Shoals 6,000 years ago? Did extinct “giant cod” really weigh over 120 pounds? Were there hundreds of European fishermen operating a profitable factory on these barren islands? How did they live? When did they arrive? Award-winning history writer J. Dennis Robinson tracks the recent discoveries by archaeologist Nathan Hamilton and his student diggers as they explore the revolutionary world of “King Haley” and the rarely-told history of Thomas Laighton’s first hotel. 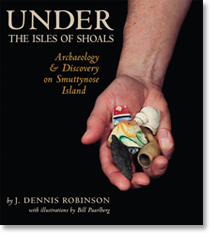 Uncover the secrets beneath the soil of Smuttynose Island in UNDER THE ISLES OF SHOALS.”— from the back cover text by J. Dennis Robinson. J. Dennis Robinson writes books about American history for young and old readers from his office in historic Portsmouth, New Hampshire near the swirling Piscataqua River where he is also a popular newspaper columnist, lecturer, and editor of the award-winning Web site SeacoastNH.com. He and his wife Maryellen Burke are long-time stewards of Smuttynose Island. Authors! We'd love to hear about your book! Publishers! We'd love to help you create beautiful covers and marketing materials for your books! Please Contact Us for more information about our services.